Top Dawg Entertainment is an American record label with artists Kendrick Lamar, SZA, Schoolboy Q, Jay Rock, Ab-Soul, SiR, Lance Skiiiwalker, and more. This Summer, they’re all going on tour together; the Championship Tour. TDE had an excellent 2017, with the release of SZA’s Billboard topping, Grammy-nominated studio album “Ctrl” and Kendrick Lamar’s American Music and Grammy award-winning album “DAMN”. They also produced the album Black Panther: The Album for the record-breaking film Black Panther. But TDE isn’t finished yet and is looking for an even bigger year in 2018. The incredible line-up starts their tour in early May, and goes through 30 cities as it comes to an end in mid-June. This is absolutely a show you can’t miss. With a talent-filled roster like the one TDE has, there is never a dull moment when it comes to their big moves. The group is going to rock Austin360 Amphitheater on May 18th, and it’s absolutely a show you can’t miss. TDE’s artists together on one stage should be incredible. 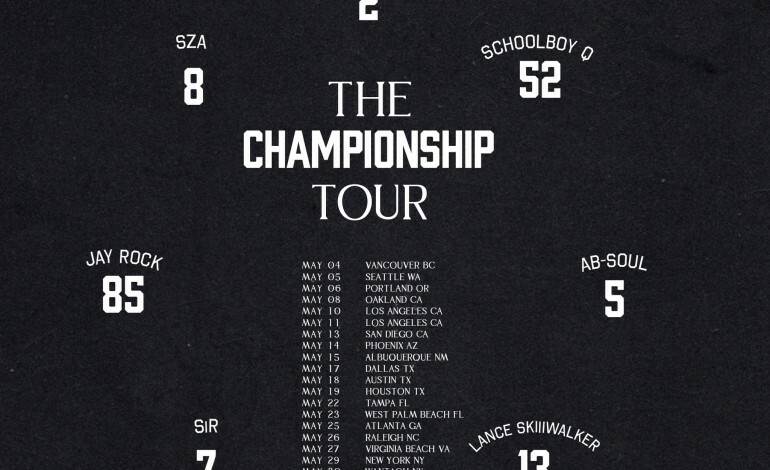 This hip-hop, rap, and R&B group says they have quite the line-up and show prepared, and after the talented pieces TDE release in 2017, I am sure this show will be nothing short of incredible.